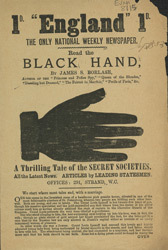 'England', featured in this leaflet, was a satirical comic. The political cartoon can be a powerful tool, especially when influencing members of the public, they can make people laugh or alternatively they can make people angry enough to take action. They are used by governments and people in power to sway opinions for and against opponents and ideas. Simple cartoons or caricatures, with few words would have been easier for the illiterate to understand.